Although transcriptomic profiling of kidney tissues or isolated glomeruli has provided insights into broad changes in the pathogenesis of diabetic kidney disease, the presence of multiple cell types in kidney samples limits what can be discerned about changes in specific types of cells. To better elucidate the mechanisms of early diabetic kidney injury, the authors used single-cell RNA sequencing technology to perform a gene expression analysis of individual kidney glomerular cells of a diabetic mouse model. A comparison of gene expression in normal versus diabetic mouse kidney cells at a single-cell level showed dynamic changes in the pattern of expressed genes. This approach may help identify important factors underlying the pathophysiology of diabetic kidney disease progression and point to potential new therapeutic approaches. Background Recent single-cell RNA sequencing (scRNA-seq) analyses have offered much insight into cell-specific gene expression profiles in normal kidneys. However, in diseased kidneys, understanding of changes in specific cells, particularly glomerular cells, remains limited. Methods To elucidate the glomerular cell–specific gene expression changes in diabetic kidney disease, we performed scRNA-seq analysis of isolated glomerular cells from streptozotocin-induced diabetic endothelial nitric oxide synthase (eNOS)–deficient (eNOS−/−) mice and control eNOS−/− mice. Results We identified five distinct cell populations, including glomerular endothelial cells, mesangial cells, podocytes, immune cells, and tubular cells. Using scRNA-seq analysis, we confirmed the expression of glomerular cell–specific markers and also identified several new potential markers of glomerular cells. The number of immune cells was significantly higher in diabetic glomeruli compared with control glomeruli, and further cluster analysis showed that these immune cells were predominantly macrophages. Analysis of differential gene expression in endothelial and mesangial cells of diabetic and control mice showed dynamic changes in the pattern of expressed genes, many of which are known to be involved in diabetic kidney disease. Moreover, gene expression analysis showed variable responses of individual cells to diabetic injury. 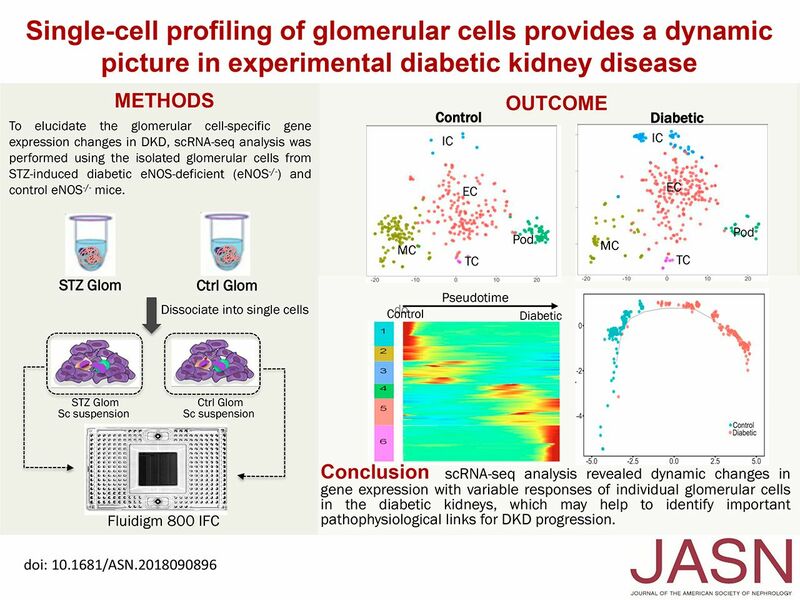 Conclusions Our findings demonstrate the ability of scRNA-seq analysis in isolated glomerular cells from diabetic and control mice to reveal dynamic changes in gene expression in diabetic kidneys, with variable responses of individual cells. Such changes, which might not be apparent in bulk transcriptomic analysis of glomerular cells, may help identify important pathophysiologic factors contributing to the progression of diabetic kidney disease.